Waterway Primary School’s Computational Thinking Programme has been featured on IMDA’s website. As part of our partnership with SIT, two SIT scholars shared with our students on their area of study (computer engineering) during the “Good Morning School” programme on 13 February 2019. Click here to view the photos of the sharing. On 4 August 2018, 4 of our students represented the school to share with a crowd of about 4000 the SGSecure national movement at the Pasir Ris-Punggol GRC National Day Dinner 2018. In April 2018, we sent 4 teams of P2 students to participate in "Speak Up! Kids 2018", a nationwide public speaking competition organised by SPH and Speech Academy Asia. All 4 teams progressed to the finals. The team comprising Saloni, Nyla and Isa from 2G clinched the First Runner-up title in the Lower Primary category. On 3 June 2018, our school sent 2 teams to participate in the Kubo Challenge organised by IMDA. We would like to congratulate the teams comprising of Charlotte Loo and Rachel Loh as well as Ethan Tan and Lewis Loo for coming in 1st and 2nd respectively in the 7-9 years old category. Well done boys and girls! Our teachers at Waterway Primary School facilitated the Primary Two students in a nature trial project on the flora and fauna along the Punggol Waterway Park. Find out more from this link. Minister for Education (Schools) Mr Ng Chee Meng commended us on our initiative for raising a kickstart fund for the "Pay It Forward" Coffee project in his facebook post. Click here to view the post and pictures. 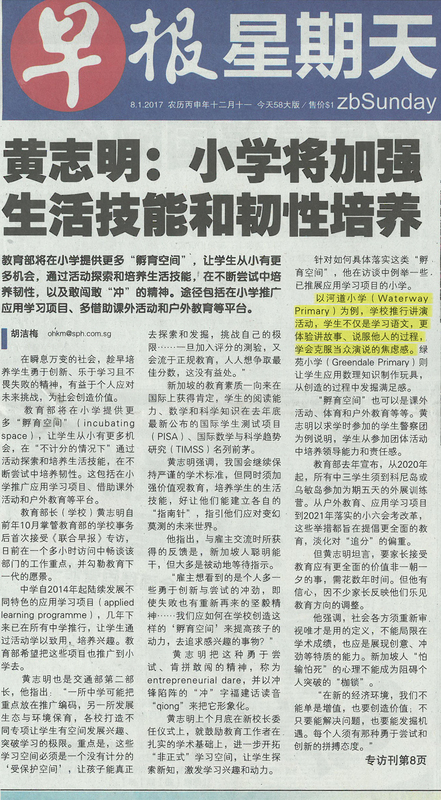 Our Orators@Waterway programme was highlighted in the Lian He Zao Bao. Waterway Primary School's Orators@Waterway Programme was featured on MOE's Facebook. Our Principal, Mrs Wee-Kwan Liam, was featured in a news article giving her comments about the new PSLE Scoring and S1 Posting. Take a look at what our parents have to say about Waterway Primary School. Find out more here.